On Labor Day, 1921, the twelfth floor of the St. Francis Hotel hosted a “get-together” that was meant to be a social gathering filled with bootleg alcohol and some of Hollywood’s most notorious. Present in the suites of rooms 1219, 1220 and 1221 were Lowell Sherman, actor and film director; Fred Fishback, film director, actor, screenwriter, and producer; Maude Delmont, friend of film publicist Alfred Semnacher; and Virginia Rappe, film actress. The man throwing the event was Roscoe “Fatty” Arbuckle, who at the time was the most well-known silent film actor, comedian, director and screenwriter. Arbuckle took a break from his hectic film schedule that Labor Day Weekend to travel with Sherman and Fishback to San Francisco. What Arbuckle did not see coming was a weekend ending in death and the sudden halt to his rising stardom. 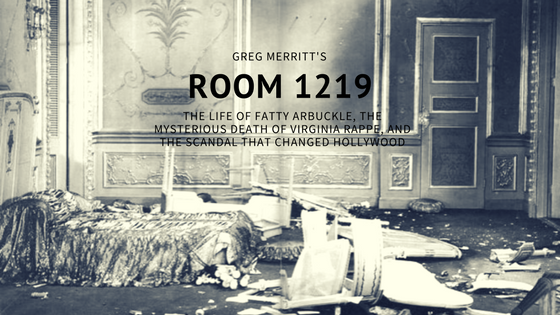 Although accounts of what happened that day range from speculation to pure exaggeration, author Greg Merritt dives deeper than anyone has before into the lives of Arbuckle and Rappe in his book, Room 1219: The Life of Fatty Arbuckle, The Mysterious Death of Virginia Rappe, and the Scandal That Changed Hollywood. Merritt’s research into Hollywood’s first scandal is clearly outlined throughout the book, weaving in facts about the uprising of the film industry and the key players of the three trials as well as the fall and demise of Arbuckle’s life both professionally and personally. Nearly 50 pages of notes and a select bibliography round out the end of the book, showcasing just how much research it took to get the facts as straight as possible. The case of Arbuckle and the alleged manslaughter of Virginia Rappe not only created headlines in the early 1920s but continued to make its way into news stories that shared similar unethical behavior. Merritt addresses them and debunks many of them in an effort to show that the actual outcome of what happened in that hotel suite has never been solved. Room 1219 combines mystery with development of film technology and the rise of Hollywood studios. Although the jump back and forth between periods of time makes a difficult read, it’s the attention to detail that jumps out the most. Every newspaper headline, every direct quote from those involved in the case – they were all complied into a well-needed biography showcasing every minor detail of Arbuckle’s era. The film industry may never know what happened to Virginia Rappe inside of room 1219 at the St. Francis Hotel, but they do know what a good enough scandal can do to someone’s career.